It is very important to determine the amount of sulphur dioxide in wine directly in the winery, during the wine-making process and in particular during the bottling process using a simple method that enables you to make the necessary corrections in real time without having to wait for the analytical results to come back from the laboratory. CDR WineLab® allows you to determine the concentration of sulphur dioxide directly in the winery with a fast and intuitive method: it is in fact sufficient to add the wine sample as is to a cuvette that contains the appropriate reagent, insert the cuvette in the reading cell of CDR WineLab® and wait one minute to obtain the result. This approach eliminates the need of performing a titration, which is far more complex and is influenced by several factors, like the colour of wine and the presence of ascorbic acid. 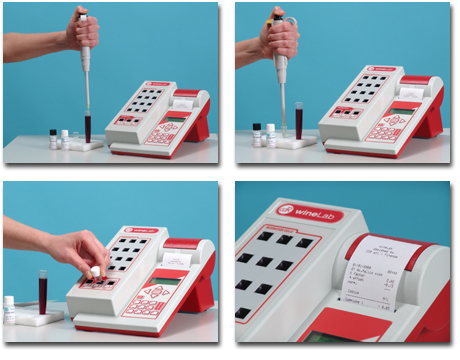 CDR’s WineLab method also offers the advantage of using fresh reagents because it foresees the use of practical single-dose pre-filled vials that eliminate the need of preparing solutions or reagents that deteriorate and must be disposed of if unused. The CDR WineLab® method enables you to obtain analytical data in real time and in the winery; you can therefore make the necessary corrections without having to wait for the results to come back from a laboratory. Wine Testing: How to Independently Analyse Sulphur Dioxide in your Winery was last modified: May 22nd, 2017 by CDR s.r.l.